The World Rally Championship’s Rally de España was going it’s usual way as champion Seb Ogier had a huge lead over his rivals. But when he smashed up his VW just moments from the finish, Ogier’s teammate Andreas Mikkelsen had been gifted his first WRC victory. 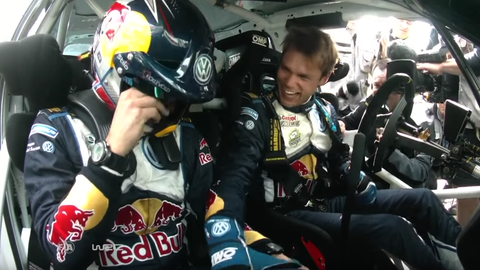 In these final stage highlights you can see the moment Mikkelsen and co-driver Ola Floene found out they’d won their first world rally and things got damn emotional.